Swedish Open Media Officer Andreas Källman previews the Swedish Open below, a tournament that has been held annually in Enskede Rackethall, the Racketlon Mekka of Sweden, since the beginning of the Nineties. This year it has been appointed one of four "Super" World Tour Events on the FIR Racketlon World Tour. The Super World Tour Event is a new concept introduced by the FIR in order to increase focus on a few tournaments that get a better chance to gather the top players. In return they have to live up to higher requirements (such as a minimum of 2000 Euro of prize money). After Stockholm, the remaining Super World Tour Events on the 2007 Tour will take place in Toronto, Oudenaarde (Belgium) and finally, just after Christmas, in Rotterdam - a tournament that will also be this year's World Championships. The Swedish Open draws can be found on the Tournament Homepage. 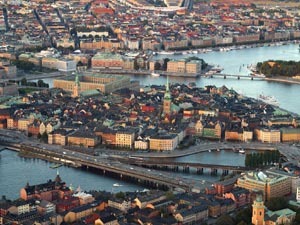 Stockholm "city on water" greats the Racketlon community. With almost 200 participants, 66 foreigners from 9 countries, competing in 8 different classes, this is going to be the largest tournament so far here in Sweden. We will start by lunchtime on Friday the 12th, and already the first day we have loads of interesting matches! From Friday 17:45 you can watch the worlds 7 best Racketlon-players start working their way towards the final, that will take place on Sunday the 14.th. Imagine a semifinal between World No 1, Magnus Eliasson and Douglas Struthers, separated by 1 one point when they met in England last October. And how is the form for Stefan Adamsson? Can he challenge as well as he did last time, when he had the lead, 9-6 in tennis, and needed 16 to win against Magnus in the final of Swedish Open 2006. Check out the Ladies draws! The four first seeded, are also the four best women in the world! We´re happy to see Lilian competing again, trying to challenge World No 1 Linda Jansson, Susanna Lautala-Näykki and Katy Buchanan, a stronger set of players than in the World Championships! And what a future we have! 14 juniors, playing in 2 classes; U 21, and U 16. The veterans have awakened! 28 players in + 45, among them World No 1 and 2, Ulf Bredberg and David Greatorex, challenged by former Swedish Open Champion Peter Bittár! And in + 55 Lennart will try to go all the way, as he is 2nd seeded, challenging David Sutlieff and 6 others! On Saturday evening, we will go to the nearby inn, for good food, maybe a beer, and of course for some good company and to feel the Racketlon-atmosphere! Lennart Eklundh is working night and day!, to make sure that this tournament is not to forget in the future! The Swedish Open Organizing Team wish all foreigners a great time, and may the best man or woman win! - What could rising German star Alexander Köpf do against O'Donnell in the second round? 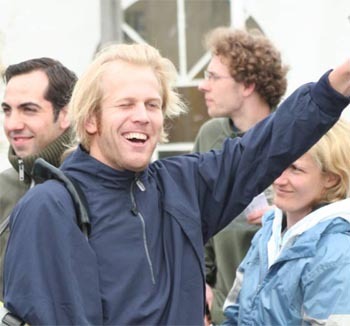 Köpf is slowly getting a reputation of "Swede killer" after his recent victories over high quality players Henrik Håkansson (at the Worlds) and Mika Hasmats (in Gothenburg Open). - And don't miss the squash set between Eliasson and Jukka Salminen in the first round. Bring your timer! These are good retrievers! This could be a classic (if not this year maybe in the years to come; Salminen is still learning...). - How good is Finland's number 2, Pekka Kainulainen (facing Struthers in the second round) now? He upset the seedings at the Worlds by beating Rickard Persson +8 (5-21, 21-11, 21-16, 21-12). - Wall has got Roland Helle (WR 19 and unseeded(!) after few tournament appearances lately - but the runner-up(!) in the 2004 World Champs) in the second round already. An acid test for rising star Wall. How good is he really? - Weigl faces Håkansson (WR17) in the second round, whom he has never managed to beat. - Will recent Dutch Open champion Schaub survive the first round? Joachim Nilsson (WR20) looked really good in Gothenburg, where he lost to winner Wall by 2 points only. - There are many new names in the Ladies' class. Is there, perhaps a "Linda Jansson" (the Swede, who became World Champion little more than a year after she first took up Racketlon) surprise hiding behind first time names like Marika Leringe, Hanna Bergman, Julia Vilkenas or Anna Bjällmark? It would be a big surprise though if someone could threaten the top 4 ranked ladies from reaching the semifinals. In a class of their own? 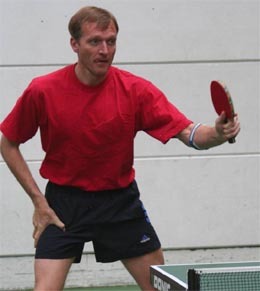 - Graham Norton faces Germany's Volker Sach (unranked and just turned old enough to take part in the Vets). Sach could be a threat to almost anyone in the Vets class - but he has just returned from knee surgery so his momentary shape is uncertain. Volker Sach, Germany. Just turned vet. - What could Johan Linse (the bronze medalist of the Gothenburg B Class) achieve against David Greatorex in the second round? Linse has just turned old enough and took up Racketlon over ten years ago. Watch out, David!